There was a special celebration on the shores of Lake Brienz yesterday afternoon. Florens Resort & Suites held a topping-out ceremony to mark the completion of the structural work on the first eight apartment blocks. Numerous residents of Oberried and Niederried accepted the invitation, as did business partners involved in the project. The celebrations took place in a marquee on the Florens Resort & Suites construction site, with the sunny shores of Lake Brienz forming a stunning backdrop. Mr. & Mrs. Baby, the well-known band from Interlaken, helped create a party atmosphere, while Thun-based company Enoteca Italia looked after the catering. “I would like to express heartfelt gratitude to our private investor and all our partners. A big thank-you is also due to the mayor of Oberried, Andreas Oberli, as well as to the municipal council, the member for the cantonal parliament, Peter Flück, the representatives of various authorities, Steiner AG, all our partners and – last but not least – you, our neighbours. After all, without you we would not be celebrating this milestone today,” said Paul Wehrens, CEO of Lake Resort Interlaken AG, in his speech of thanks. The guests then watched a presentation about the progress of the building work and the plans for the next few months, delivered by Miriam Malzkeit, CEO of Brienzersee Resort AG. Excavation work for the other buildings is continuing and windows are being fitted in the existing blocks. Ronald-Guido Menz, head of TC/GC Region Center at the design-and-build contractor Steiner AG, which is carrying out the work, thanked all those involved in the project for their outstanding efforts. Andreas Oberli, the mayor of Oberried, welcomed the guests and gave a fascinating account of the resort's history. After the speeches, those present visited the construction site in small groups, with an opportunity to ask questions. Lively conversation over drinks in the evening sunshine rounded off the afternoon for the 120 guests and their hosts. Florens Resort & Suites is an exclusive eco-lifestyle resort consisting of 155 apartments and suites being built on the shores of Lake Brienz (due for completion 2020/21). The owners of these unique holiday homes enjoy easy access to the Bernese ski resorts in winter and their own marina for water sports in summer. The 65,000-square-metre complex looks out over the UNESCO World Heritage Site of the Jungfrau-Aletsch mountain landscape in the Swiss Alps. An emphasis on sustainability is demonstrated through the use of environmentally friendly construction materials (natural stone and wood), as well as in the food supply. Organic foodstuffs grown on the site itself support the concept of living in harmony with nature. It is noteworthy that foreign investors, too, are able to acquire a piece of this Swiss idyll: the letting arrangements allow the apartments to be rented out if wished, thus achieving an attractive return. Oberried bei Interlaken is easily accessible from many directions and offers a wide variety of leisure activities throughout the year. Above all, though, residents of the Florens Resort & Suites benefit from a relaxing retreat where they can unwind and recharge, or concentrate on some work in an inspiring atmosphere. 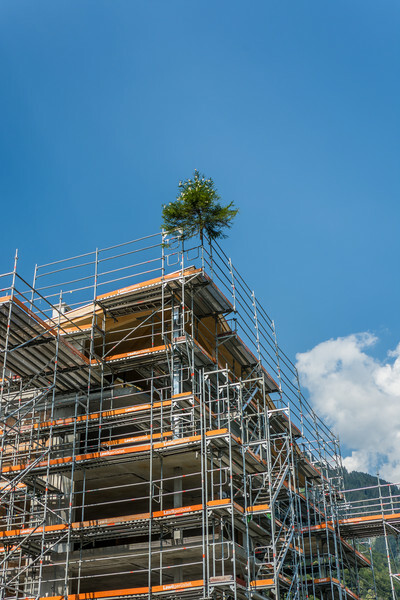 The topping-out ceremony of Florens Resort took place on the sunny shores of Lake Brienz.